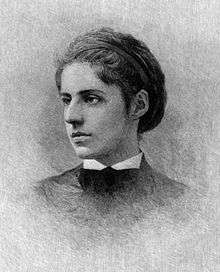 Emma Lazarus (July 22, 1849 – November 19, 1887) was an American poet born in New York City. She is best known for "The New Colossus", a sonnet written in 1883; its lines appear inscribed on a bronze plaque in the pedestal of the Statue of Liberty installed in 1903, a decade and a half after Lazarus's death. Lazarus was born into a large Sephardic-Ashkenazi Jewish family, the fourth of seven children of Moses Lazarus and Esther Nathan. The Lazarus family was from Germany, and the Nathan family was originally from Portugal and residents in New York long before the American Revolution. Lazarus's great-great grandmother on her mother's side, Grace Seixas Nathan (born in New York in 1752) was also a poet. Lazarus was also related through her mother to Benjamin N. Cardozo, Associate Justice of the US Supreme Court. From an early age, she studied American and British literature, as well as several languages, including German, French, and Italian. Her writings attracted the attention of Ralph Waldo Emerson. She was also an early admirer of Henry George, and was a part of his Single Tax movement for a number of years. Lazarus wrote her own important poems and edited many adaptations of German poems, notably those of Johann Wolfgang von Goethe and Heinrich Heine. She also wrote a novel and two plays in five acts, The Spagnoletto, a tragic verse drama about the titular figure and The Dance to Death, a dramatization of a German short story about the burning of Jews in Nordhausen during the Black Death. Lazarus began to be more interested in her Jewish ancestry after reading the George Eliot novel Daniel Deronda, and as she heard of the Russian pogroms that followed the assassination of Tsar Alexander II in 1881. As a result of this anti-Semitic violence, thousands of destitute Ashkenazi Jews emigrated from the Russian Pale of Settlement to New York, leading Lazarus to write articles on the subject, as well as the book Songs of a Semite (1882). Lazarus began at this point to advocate on behalf of indigent Jewish refugees. She helped establish the Hebrew Technical Institute in New York to provide vocational training to assist destitute Jewish immigrants to become self-supporting. She is best known for the sonnet "The New Colossus"; its lines appear on a bronze plaque in the pedestal of the Statue of Liberty placed in 1903. The sonnet was written in 1883 and donated to an auction, conducted by the "Art Loan Fund Exhibition in Aid of the Bartholdi Pedestal Fund for the Statue of Liberty" in order to raise funds to build the pedestal. Lazarus' close friend Rose Hawthorne Lathrop was inspired by "The New Colossus" to found the Dominican Sisters of Hawthorne. Lazarus is also known for her sixteen-part cycle poem "Epochs". She traveled twice to Europe, first in 1883 and again from 1885 to 1887. On one of those trips, Georgiana Burne-Jones, the wife of the Pre-Raphaelite painter Edward Burne-Jones, introduced her to William Morris at her home. She returned to New York City seriously ill after her second trip and died two months later on November 19, 1887, most likely from Hodgkin's lymphoma. She is an important forerunner of the Zionist movement. She argued for the creation of a Jewish homeland thirteen years before Theodor Herzl began to use the term Zionism. Lazarus is buried in Beth-Olom Cemetery in Brooklyn. Emma Lazarus was honored by the Office of the Manhattan Borough President in March, 2008, and her home on West 10th Street was included in a map of Women's Rights Historic Sites. In 2009, she was honored by induction into the National Women's Hall of Fame. The Museum of Jewish Heritage featured an exhibition about Emma Lazarus in 2012. Lazarus, Emma (1888). The Poems of Emma Lazarus. Houghton, Mifflin and Company. Retrieved 2008-12-12. ↑ "Jewish Women's Archive: Emma Lazarus". Retrieved 2008-01-10. ↑ Schor, Esther. Emma Lazarus. Schocken, 2008. ↑ "Progress and Poverty". The New York Times. Jewish Women's Archive. 2 October 1881. p. 3. Retrieved 21 May 2013. ↑ Sugarman, Yerra (2003). "Emma Lazarus". In Parini, Jay. The Oxford Encyclopedia of American Literature. Oxford University Press. p. 413. ISBN 978-0-19-515653-9. ↑ "Exhibit highlights connection between Jewish poet, Catholic nun". The Tidings. Archdiocese of Los Angeles. Catholic News Service. 17 September 2010. p. 16. Archived from the original on 21 September 2010. Retrieved 20 September 2010. ↑ Judith Flanders, A Circle of Sisters (2001) page 186. ↑ "Manhattan Borough President - Home". ↑ "Lazarus, Emma". National Women's Hall of Fame. Retrieved 1 November 2016. Vogel, Dan (1980). Emma Lazarus. Boston: Twayne Publishers. ISBN 0805772332. This article incorporates text from a publication now in the public domain: Gilman, D. C.; Thurston, H. T.; Colby, F. M., eds. (1905). "Lazarus, Emma". New International Encyclopedia (1st ed.). New York: Dodd, Mead. Wikimedia Commons has media related to Emma Lazarus.